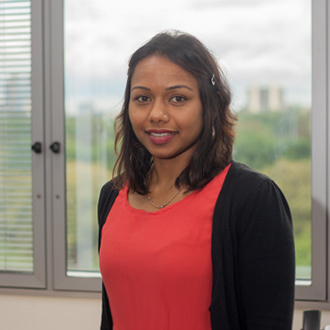 Dr Artika Nath has recently completed her PhD titled Integrative genomics to understand immune function and regulation. She is currently working as an AMSI bioinformatics intern at CSL Limited co-supervised by A/Prof Michael Inouye and CSL industry supervisors Dr Milica Ng and Dr Monther Monther Alhamdoosh. Her AMSI project involves the development of genomic variant–calling pipeline and eQTL mapping studies using publically available RNA-seq data. Artika joined the Systems Genomics Laboratory in 2013 after being awarded the Australian Postgraduate Award (APA) and International Postgraduate Research Scholarship (IPRS). Her PhD thesis focused on the integration of genetic variation with other intermediate phenotypes such as transcriptomic, metabolomic, and protein profiles to gain mechanistic insights into human health and disease. Her primary interest is to understand the interplay between immune function, metabolism and their gene regulation in natural populations. She holds a Masters degree in Biological Sciences from Georgia Institute of Technology in USA and a BSc (Hons) degree in genetics from the University of Otago in New Zealand. She is a former recipient of a Fulbright Fellowship.